Most people I know take the road of less resistance because they are afraid of failing. The problem with this type of fear is that it can potentially control and ruin our lives. Instead of doing what we love, we shrink back in our comfort zone and never have the chance of knowing what’s beyond the bend. Are you afraid of failure? Then, you need to read these 5 reasons you should not. I believe the best things that can come out from failure are the lessons we can learn from it. While it is wise to learn from the mistakes of others, there is a whole world of difference if you experience it yourself. Failures are like teachers. It teaches you what works and what’s not. The valuable lessons you learn from failure makes you wiser and better equipped in attaining your goals. When people look up to the successful people, they think that they are geniuses who have never experienced failure. This is my way of thinking before, but I realized that what we see is just the end product of the failures of their lives. Most of the greatest and successful people in this world are not afraid of failure. They take it head on. They take each failure and use it to catapult them to success. Read about the life of Soichiro Honda, Anthony Robins, Henry Ford, Thomas Edison, Abraham Lincoln, and other famous historical figures. You will soon see the big role failure has played in their pursuit of success. People who fail knows how it feels. They know the frustrations and disappointments that come with failure. Because of this, they are able to better relate with other people. People who have experienced failure will not just sympathize, but they will empathize with the frailty of other people. Because of this, people who failed can be more patient, merciful and loving to his fellow. The people who are afraid of failure are the people who are most likely the weakest. The more difficult a trial is, the stronger you can become. It is like lifting weights. You can’t expect to build your muscle if you just lift the 5-pound dumbbell all year long. You know that you are doing something worthwhile when it is difficult to accomplish. Physical and spiritual growth is not developed within a vacuum. It must be tried through trials and challenges for it to grow. Can you think of a person who never failed? The answer is obvious. Failure is a normal part of life. It is inevitable. It is something you should expect. You are greatly mistaken when you spend all your life avoiding it to the point that you are just living a life of fear. The greatest achievements in this life are those built upon failures. Use failures as stepping stones towards your goal. We are Christians not because we are perfect and righteous, but because we are human beings prone to committing failures. God knows this and through His mercy and grace, gives us the opportunity to spiritually grow. “And not only that, but we also glory in tribulations, knowing that tribulation produces perseverance; and perseverance, character; and character, hope. Now hope does not disappoint, because the love of God has been poured out in our hearts by the Holy Spirit who was given to us” (Romans 5:3-5). God will not condemn you for a moment of weakness and failure. As long as you are doing your best and your heart is right with God, then He will continue to be with you. 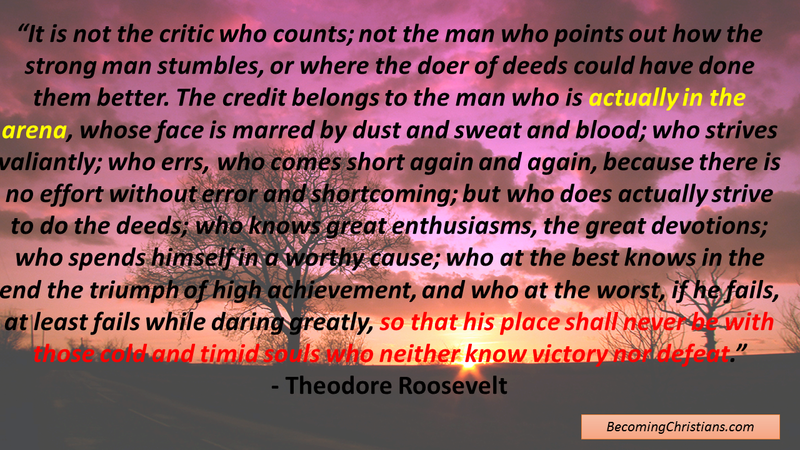 My point here is that we must not prevent ourselves from attaining success by being afraid of failures. If you want to be successful, you need to be ready to fail. I am not saying that you should intentionally fail as that is foolishness. Instead of being afraid of failure, be afraid of not trying. How about you? Are you afraid of failure? Share your thoughts by commenting below.